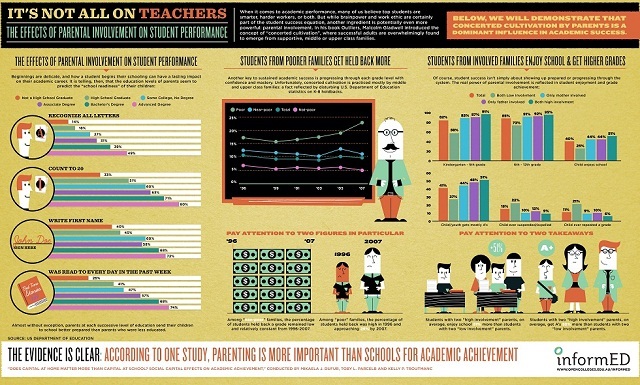 The influence of parental involvement on a student’s academic success should not be underestimated. While brain power, work ethic, and even genetics all play important roles in student achievement, the determining factor comes down to what kind of support system she has at home. Students with two parents operating in supportive roles are 52% more likely to enjoy school and get straight A’s than students whose parents are disengaged with what’s going on at school. This is especially the case during the earliest years of schooling, in Kindergarten through the 5th grade, when students with active parents are almost twice as likely to succeed. Once students enter middle school, the effect diminishes slightly—possibly because they are maturing during this time— but there is still a 22% difference. The data shows, predictably, that having one parent involved is better than having none at all. Interestingly, as far as behavior is concerned—being held back or expelled— having a supportive mother makes a slightly more positive difference than having a supportive father. Having a supportive father, however, leads to slightly higher grades than having a supportive mother. Just as there seems to be critical period for parental support in terms of general academic success (K-5), there is also a critical period for parental support with regard to “school readiness.” Before a student enters primary school, her parents have a huge influence on how well she will perform. Did her parents introduce her to the alphabet? Did they read to her every night? Did they teach her to count? It appears that a parent’s level of involvement in school readiness correlates significantly with that parent’s own educational attainment. Parents with advanced degrees are 3.5 times as likely as parents without high school degrees to teach their children the alphabet, 2.4 times more likely to teach them to count to 20, 1.8 times as likely to teach them how to write their first name, and 2.8 times more likely to read to them daily. Even the difference in involvement between parents with advanced degrees and parents with bachelor’s degrees hovers around 10%. Almost without exception, parents at each successive level of education send their children to school better prepared than parents who are less educated. This suggests just how delicate beginnings can be in a child’s educational development, and just how important it is for less educated parents to try to be more involved. Another key to sustained academic success is progressing through each grade level with confidence and mastery. But even if the parental support is there, financial setbacks can pose serious problems. Between 1996 and 2007, the percentage of “low-income” students typically held back a grade reached 25%, while the percentage of “non-poor” students remained low and relatively constant. This data reflects the unfortunate reality that successful adults are overwhelmingly found to emerge from supportive middle or upper class families. For more information on this effect, dubbed “concerted cultivation,” see social scientist Malcolm Gladwell’s book Outliers: The Story of Success (2008). People can say what they want, but the day does not end when school lets out. That is when the support, encouragement, follow through and over seeing of the education of our young ones begins. As a former classroom teacher, this topic strikes a HUGE chord with me. I have always believed education is a team effort- with a lot of the effort needing to come from the home environment. A classroom teacher can only do so much. They are so overworked and so underpaid! This issue is one of the reasons that I left the demands of the classroom so that I could be involved in my own children’s education. I had the privilege to teach inner-city students with very little support from most of my student’s parents (never had a ‘classroom parent’ to plan parties, or parents to volunteer in the classroom etc.). The students who were successful, in most cases, tended to have parents at home that were attentive to their academic progress. And in these cases, this wasn’t much. It was a general ‘caring’ about what was being learned in the classroom demonstrated by the daily planner being signed, folders being checked and emptied, phone calls/emails being returned, attendance at parent-teacher conferences, lunches being packed (or hot lunch account being funded) and homework being completed. I could always tell the parents who were attentive to their child’s educational well being and the parents who were not…and it really does not take much. With that being said, because I taught ‘inner city’, I do understand that many parents do not have the capabilities and resources to be involved due to many issues and factors. I am very sensitive to this issue (my background being social work) and this is when and where the classroom teacher, school counselor, principals and resource teachers MUST become heavily involved. This is a very important issue and one that I am passionate about. Thanks for sharing! Well, isn’t this a perfect argument AGAINST teacher pay based on student test scores?! There are so many factors that determine a child’s performance in school, it is completely unfair for blame teachers for everything. It seems to me it is the least educated that need the most education about the importance of parental involvement in all areas of a child’s life, not just education, and it’s the more educated who understand its importance on their child’s future. It’s also a difference of social acceptability; so often in the former, it’s not the way to be, while in the latter, it’s the only way to be. And it’s a matter of expectations for the future of one’s child. If the less educated could be informed as to the value of their parental participation and brought around as a group to embrace that participation and education inside and outside the classroom, then society as a whole would see improvement. I often think that if EVERYONE understood the value of knowledge in every aspect of our lives (health, education, finances) and heeded it, that many of our social ills would be eliminated or, at the very least, decreased. Thanks for your great article, we certainly do have a plethora of evidence available on the world wide web regarding this subject. Indeed I would have to agree that parental involvement in a child’s education provides a child much of the necessary encouragement and help to achieve better in any learning environment including the current schooling systems, that evidence is very suitably proven. I would like to bring an observation to the discussion. The question that begs to be answered is, why do so many parents these days, more than our predecessors, have the misconception that their respective country’s schooling system (Government Education Departments that direct our local schools and teachers) is responsible for their child’s education? The answer could lie in the following explanation. I have read that people in high places wanting to implement a “New World Order” have manipulated education over many years. It is said that these people manipulate through subtle physiological changes in education methods and this has occurred over many years with each successive generation. I am shocked to understand if all this is true that this system has provided all of us with a systematic brainwashing including myself. If this is true, most teachers would be unaware of these things and their understanding this monster system would be of ignorance. If this is so they too have been brainwashed by the very system to which they have been taught. I have also read that due to the frustrating teaching time limitations of this monster educational system, teachers have got to sink or swim in the highly over-regulated system. It is documented well that this leaves teachers burdened with the now required mass of recording that is required by the system. It is further understood that most of this work records the psychological profile of each student not so much their educational progress. Added to all this extra work load most teachers find themselves getting little support from parents and to a large extent society. Most savvy teachers, and you can’t blame them, leave this system before they burn out. I would ask the questions, what are teachers working for or rather who? Are teachers there to teach children or are they there to implement a system of over regulated physiological manipulation of our children, with little parent input? I’m honestly speechless, everyone has taken all of my thought straight out of my head and placed them here for my eyes to finally gaze at them. I feel so hopeful and my heart is full, thank you everyone for your well articulated observations and genuine concern for knowledge and personal well-being.